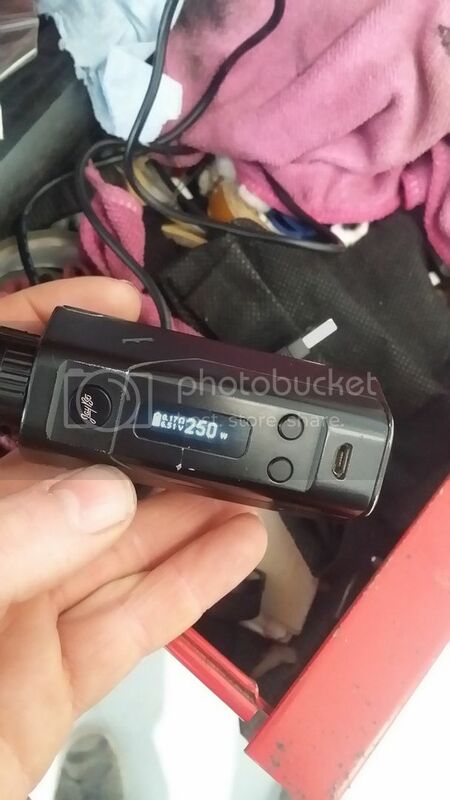 The firmware for the RX200 has been updated to 3.10. I hear that the mod now goes up to 250W. I'll not be trying that any time soon. Hopefully they've tidied up some stuff like the wildly inaccurate voltmeter. Nope - voltmeter still useless. The display does now say 250W. I'll wait for someone to stick a power meter onto the 510 and see what it really does. Todd has the kit and hopefully will be along to check it out. V/ir to get the optimum resistance coil and I'll give it a thrashing when I get home. Seems to be hitting harder toward the 150 mark, can't push the vcmt any harder with the coils I've got in it. I must have gotten something wrong surely? At .17 Ohms that adds up alright. According to that a .17 coil was in order.. done it, don't recommend it. The wattage update is for bragging rights, nothing more. There's a 316ss mode for better tc on ss.. not tried it yet, looking forward to it tomorrow. Snuk in again while I wrote tw. (14-04-2016 08:46 PM)gentlydoingit* Wrote: Series can't pull that kind of amperage, what were they thinking?! That's what I was thinking, too. 38 amps! Ay carumba! Now, this brings me to a question. There are a lot of people I see here 'moving up' to a box mod and getting the RX200. 38 amps (serial configuration) is frankly not a good place to be for a lot of cells. Why would they allow an upgrade to that threshold, especially when it's such a popular choice for green vapers who may not be fully aware of such things? Not 38A at the source. 12.6V input with fresh cells, 11.1 or so with dead ones. 250W out is still pushing it rather too hard though. That's 83W per cell. Personally, I think 50W per cell is more than enough draw. Your smart is showing again.